JIM LUJAN. COM: Press release: WE DONT NEED NO STINKIN' BADGES! Press release: WE DONT NEED NO STINKIN' BADGES! "We ain't waiting for Hollywood to deputize us! Badges?! We Don't Need No Stinkin' Badges!" 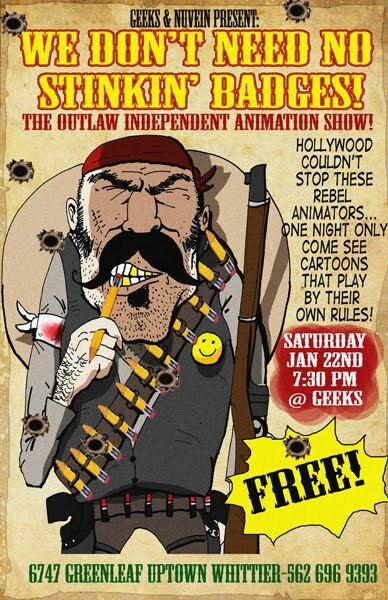 Geeks comic shop, 6747 Greenleaf Ave. in Whittier, will host the event. The Nuvein Foundation of San Gabriel Valley will sponsor. The Nuvein Foundation's mission is to raise scholarship funds for students and professionals in the arts, and showcases art via community performances and educational programs. Did I marry Art Lopez???? Also, I am a HUGE fan of PES!!!!!! DOH! I didnt see that. See I should have typed it up! :) I'll see if they can fix it!